© REUTERS/Aaron P. Bernstein Comedian Michelle Wolf performs at the White House Correspondents' Association dinner in Washington, U.S., April 28, 2018. 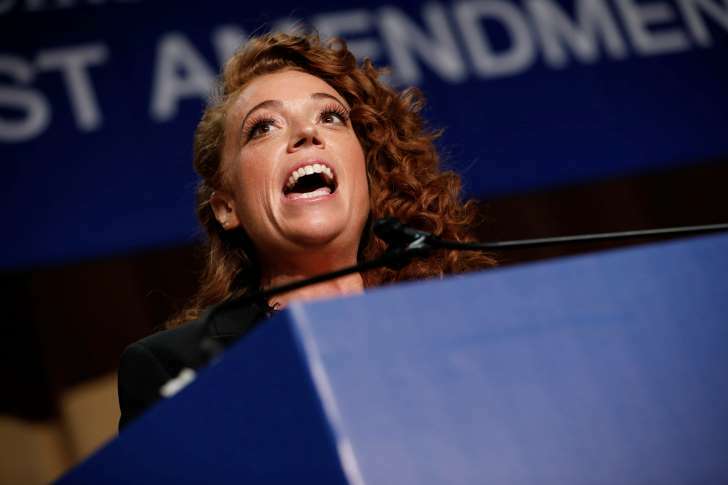 It’s been less than 48 hours since Michelle Wolf said White House press secretary Sarah Huckabee Sanders burns lies and uses the ash as eye shadow at the White House correspondents’ dinner. The comedian finally — though “finally” is a poor word choice because, again, it’s been less than two days — weighed in on the situation in an interview with Terry Gross on WHYY’s “Fresh Air.” The full interview will be available Tuesday afternoon, but NPR released Monday some choice excerpts from the conversation. And burn it to the ground, she did. It was one of many that ripped into Sanders, and the punchline of all these jokes shared a common idea — in Wolf’s view, Sanders lies to the press. But many critics took it to be a comment on the press secretary’s physical appearance, rather than her integrity. And, as many noted, Sanders was mere feet away from Wolf, watching the comic with a fairly blank (certainly not pleased) expression.